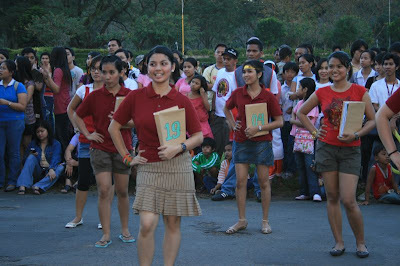 the most memorable was the dance number from the College of Library Science and Information Services, with the teachers posing as the “briefcase girls” of a popular game show, though they held books in place of briefcases. To further promote the lantern and rather than just walk beside it during the whole parade, the 26K Dancing Librarians was formed. Borrowing from Deal or No deal, they carried books instead of briefcases as they danced to the TV show's theme (nakakapagod daw, pero sulit naman [they said it was tiring, but worth it], I admire their energy). The books, when opened, spelled out "University of the Philippines". I do not know whether local school libraries have now adopted Internet technologies for archiving, tracking or accessing books or other materials, or if they have remained as they have ever since the library card, the index card and the identification card were developed as the tripod that supported the entire library’s functioning. I doubt it. I doubt even more that public libraries – where? – have been brought up to speed. I bet they would still be up on the speed they have always moved at: immobile. I’m reminded of this quaint little immobile library I stumbled into one afternoon (a Sunday, I guess) in Bantayan town. It must have had some sign announcing itself or I wouldn’t have recognized it because, aside from that, it was just like any ordinary house in the town center. And then, this I’m sure of, it was closed. I wish I could say that he doesn't know what he's talking about, but he's actually just confirming what I have noted in the past. People don't know where public libraries, if any, are located. And if they do find them, libraries are more likely to be closed. I wish I had a brilliant suggestion to improve our public library system, but I don't. I'm not even working as a librarian right now and will be leaving the country in two weeks, so all I can do is call attention to Lu's article, and hope that our library leaders read it and are moved to do something about the public's perception of our libraries. If any of you are wondering whatever happened to the Crash Program that was supposed to be held earlier this year, you should take a look at "PGLL Round Table Discussion on RA 9246" (pdf; SLIS Newsletter, Jan-Mar 2007, p. 2). The way I read it, the Crash Program was contrary to the provisions of Republic Act No. 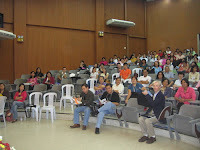 9246 (or RA 9246), and that's why the UP SLIS faculty was "bothered with doubts" about conducting the program. Another matter tackled in the article is the rumor, which has been going around since R.A. 9246 was enacted in 2003, that students with master's degrees will not be allowed to take the licensure exam after five years. Not true. Those with master's degrees in library and information science (or MLIS) are allowed by R.A. 9246 to take the licensure exam after 2010 (see also "Who Can Take the Librarians' Licensure Exam?"). Only those with degrees other than MLIS (e.g., MA Library Science) will be disqualified from taking the exam. A Task Force was formed to look further into the matter, but I haven't heard any news on whether its position paper has been submitted or that the Board for Librarians (BFL) has adopted its recommendations. Which brings me to the point for this post. I really wish that the BFL had a better way of communicating with the members of the profession. The BFL page on the PRC website is quite useless because PRC hasn't even updated exam results for all professions in more than a year. Occasionally, emails from BFL members will circulate in mailing lists, but not everyone has access to those lists. And in fact, not everyone has email. My suggestion? The BFL should start blogging, and post copies of board resolutions and other official issuances. This way, even those who don't have email will know that they can go online to see official documents for themselves. 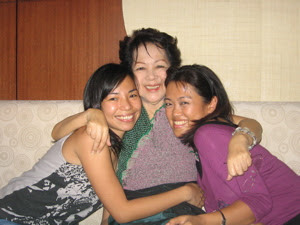 Gilda Cordero Fernando is, so far, the only Filipina who has told me, "Wanna kiss me? You're cute." For some time now I've been obsessed about finding out my mission in life. Usually, when we're asked what our mission is, we name our talent. We say, "to write" or "to sing" or "to act" or "to paint." Or we name our occupation—"to heal" or "to educate" or "to enforce law and order." And the insight I got was that "mission" and "talent" are two different things, although, of course, with some, mission and talent or occupation may be one and the same. Mission in life, it seems, is something so deep, in fact, that it requires an objective view of all the paths we have taken, how they are connected, and where they led. Is it consistent still with what we are doing now? We recognize our mission because we never tire doing it, no matter how many obstacles there are and it makes us happy. Mission has something to do with our contribution to the world and its evolution. Quite obviously a God-given task. Talents are given to us only to help along our mission. So what was mine? Of course I liked that but what did it do to clarify my mission? Was I supposed to be the bridge to the young or something? Why did I change interests so many times? Was I perchance a dilettante? I looked at the dictionary—"an amateur or trifler at art." I was not an amateur, much less a "trifler" at anything. I was serious about everything I did, completely focused on working hard to produce worthwhile results. Nope, dilettantism wasn't for me. So what was my mission? What was the common denominator of all the things that I had gotten into? How did they connect? All of them had ventured into untrodden ground, all of them were Pinoy. Just recently, Fr. Miguel Bernad, S.J. reminded me that Ateneo broke tradition when they asked me, in 1974, to be its first female commencement speaker for the high school. Indirectly and unknowingly I had opened something new. The role of an active door opener is actually not a pleasant one. After many years you may be praised for it but for now you are just "too advanced," "too avant garde," "too weird" or too foolish for words. But you know you are on the right path because ten or twenty years later everybody wants to do what you had such a tough time introducing. Your role is to be a kind of bomb disposal unit. Or a trailblazer. (I like that). "Looking for my destiny," in The Last Full Moon , pp. 206-207. I have quoted extensively from her book because there's a part of me that hopes that maybe someday, when I'm 75 years old—her age when she wrote the book—I'll figure out my mission in life, too. What Have I Learned as an IFLA/OCLC Fellow? 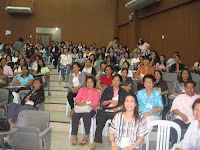 The author (left), the first Filipino librarian to become an IFLA/OCLC fellow, shares her reflections on her experience. 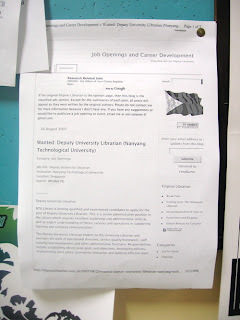 The deadline for applications for the 2009 IFLA/OCLC Early Career Development Fellowship Program is 7 March 2008. April 27 of this year, I had the opportunity to travel to Dublin, Ohio, for a five-week training as part of the International Federation of Library Associations and Institutions (IFLA) / Online Computer Library Center (OCLC) Early Career Development Fellowship Program. We were five librarians from five developing countries: there is Kodjo Elolo Atiso from Ghana; Pauline Nicholas of Jamaica; Elisangela Alves Silva of Sao Paolo, Brazil; Nevena Tomic from Belgrade, Serbia (formerly Yugoslavia), and me from... the Philippines. During the first four weeks, we were based in OCLC Headquarters in Dublin, where we sat for lectures and workshops about OCLC, its products and services. There I learned that from the original Ohio College Library Center founded by the Ohio College Association, and headed by Frederick Gridley Kilgour in 1967, OCLC has evolved into a “non-profit membership organization that has provided computer-based cataloging, references, resources sharing, e-content and preservation services to 57,000 libraries in 112 countries and territories” (Lensenmayer, 2007). The fellowship program has also given us opportunities to visit libraries and cultural heritage institutions in North America. The first that we visited were the offices of the American Theological Library Association (ATLA) and the American Library Association (ALA), both based in Chicago and sponsors of the fellowship program. We also visited the Chicago Public Library's Harold Washington Library Center, a 9-storey edifice, which is just one of 23 branches in the Chicago area alone. Next on our agenda was a visit to the Newberry Library, a special library devoted to the accumulation and preservation of knowledge in the humanities. There I found a copy of the Bible entitled "Ang Matandang Tipan Mula Sa Antiguo Testamento ng Santa Biblia" printed in Manila in 1814, still in perfect condition (talk about preservation!). After Chicago, we headed to Urbana-Champaign and visited the Mortenson Center for International Library Programs at the University of Illinois at Urbana-Champaign (UIUC). The center claims to offer "the best library training" in the US. While there, we went to the Graduate School of Library and Information Science and learned about their LIS programs. While still at Illinois, we had an opportunity to visit the Arthur Memorial Public Library, a public library and a special library in one because it caters to the needs of its special community—the Amish community, a remnant of people who fled from Germany due to religious persecution during the time of the Reformation. Well, the tour won't be complete without a visit to the Library of Congress in Washington, DC—claimed to be the largest library in the world (in terms of collection). But, would you believe that the Library of Congress is not really the national library of the United States of America? Well, it holds the distinction, and rightly so, but there are also the National Library of Medicine and the National Library of Agriculture. From the opulent Thomas Jefferson Building (which is the original building), the LC has grown to be a complex of 3 buildings, with the addition of the John Adams and James Madison buildings—all three are connected via an underground tunnel. By the way, the Library of Congress has one of the few remaining copies of Johann Gutenberg's Bible. It is displayed at the Jefferson building. The highlight of our OCLC stint is definitely our participation in the OCLC Member’s Council (MC) meeting. 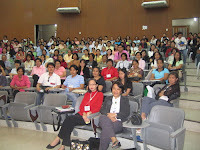 The MC is composed of 66 delegates, elected from the OCLC regional networks and service centers. It makes recommendations on what libraries and the cooperative need; and represents the interests of general members (Lensenmayer, 2007). Through this experience, "we gained insight into issues affecting global library cooperation and the governance of a global library cooperative." After four weeks of stay in the US, we proceeded to the "last leg" of the program and that is our trip to the Netherlands. We were based in OCLC PICA (Project Integrated Catalog Automation), the OCLC’s IT service arm in Europe, the Middle East and Africa. Its headquarters is in Leiden, a province about 30 minutes drive from Schiphol International Airport in Amsterdam. Europe is indeed the "old world," for they still have their "artifacts" to prove it. The cobblestone streets, the well-preserved 16th-century edifices to the early books and manuscripts that date back to as early as the 11th century. In our visits to the Leiden University Library, Konninklijke Bibliotheek (Dutch National Library) and Haarlem Public Library, all in the Netherlands, to the Deutsch Nationalbibliothek (German National Library) and Universitatsbibliothek, both in Frankfurt, Germany, we gleaned traces of the past: the manuscripts written by monks during the Dark Ages, the ornately decorated incunabula during the Renaissance, the well preserved “private library” of a Dutch renaissance man, the locks of hair of Johann Sebastian Bach and some doodling done by Albert Einstein way back during his days at the Patent Office in Germany. All these speak of Europe’s passion for preserving the past as a legacy to the present generation. One would really be amazed at the time, money and effort they have spent to continue accumulating these relics and preserving them for posterity. Of course, our European library tour won’t be complete without a visit to the IFLA Headquarters housed in the Royal Dutch Library in Den Haag (The Hague). There we met Mr. Sjoerd Koopman who talked about IFLA, “the global voice of the library and information profession representing the interests of library and information services and their users” (IFLA publication, 2007). In conclusion, let me go back to the question “What have I learned as an IFLA/OCLC fellow”? I would answer: A LOT. More than the sights, the sound, the taste of US and Europe, I learned that librarians, no matter where we are or how we are labeled, share this common passion, which S.R. Ranganathan aptly stated: “of providing the right user the right information at the right time”—only this time, with the aid of modern technology. Indeed, technology has played a great part in the success stories of library services abroad; and we must embrace this knowledge, too, if we want to remain relevant amid the onslaught of the knowledge explosion. We also need to band together. As the adage says “no man is an island”; in the same breath, we can say that no library is an island. It is irrelevant if ours is a small library or yours is big, both big and small shall suffer if we will remain isolated from one another. We need to join hands and work together for the common good of the society that we serve. If we have done that, we are indeed part of global library collaboration—providing the right user the right information at the right time, no matter where they are.